Don’t forget to list your mods along with an explanation! I’ll start PCM for Less since Bryan is doing some stuff for me. Last edited by bradyb; 09-08-2008 at 08:42 PM. Odd graph. Why did they only show a 2850rpm window? Is the power done by 5600rpm? 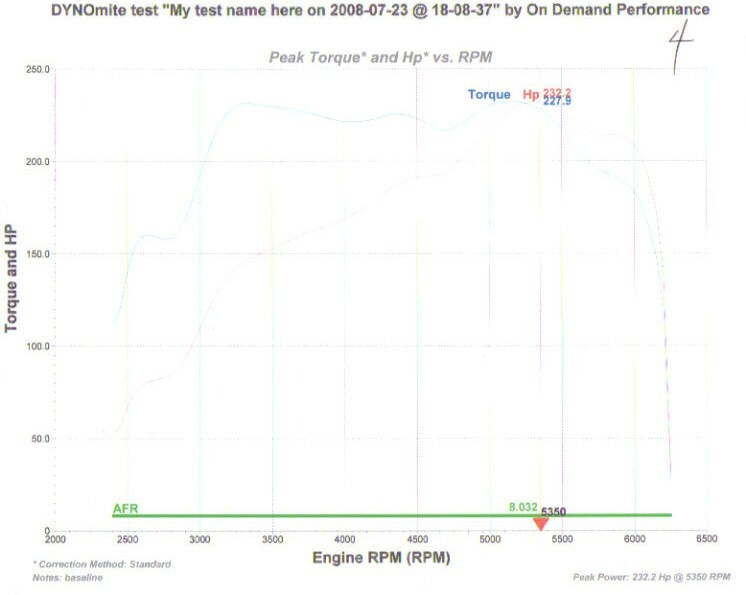 My very first dyno run from June 2007, the first Westers tune for a Solstice GXP. 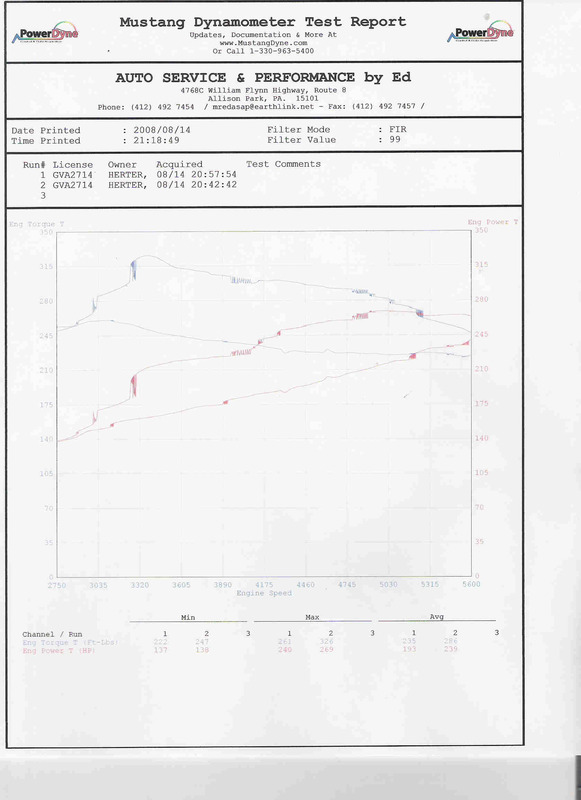 These are on an eddy current Dyno Dynamics Dyno, they tend to run well below Mustangs and Dynojet, he used a 9% compensation, I think maybe 11% would be better from what I have seen, just this dyno shop tends to be very conservative. 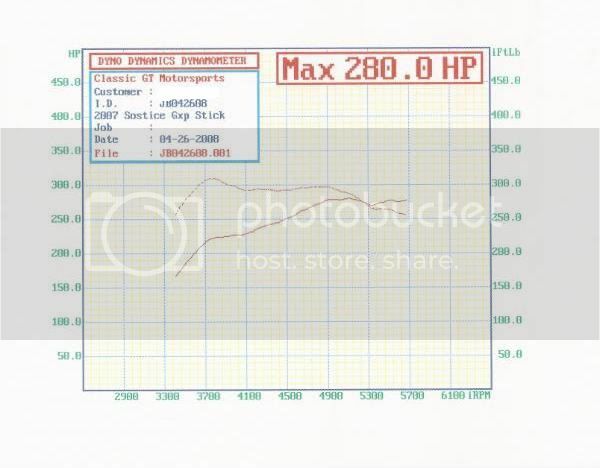 They dyno'd a stock GXP at about 216. Last edited by lil goat; 09-09-2008 at 10:13 AM. very nice goat, 286 WHP! When he did my first tune he had never seen a GXP, just adjusted what he could based on a best guess, 262 wasn't bad for a first try. Just understand when you are looking at the figures you most take into account what other mods the car has, since that will have a significant change in the numbers. A car with ALL stock hardware and a tune will have different figures to the same car with Exhaust system, intercooler etc. 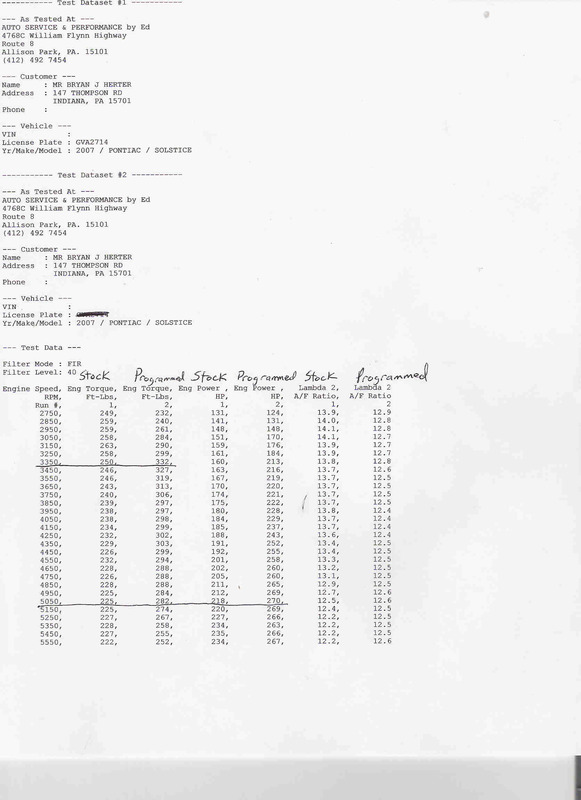 Also the type of Dyno gives different results. Lil-Goat has a nice signature with listed mods. 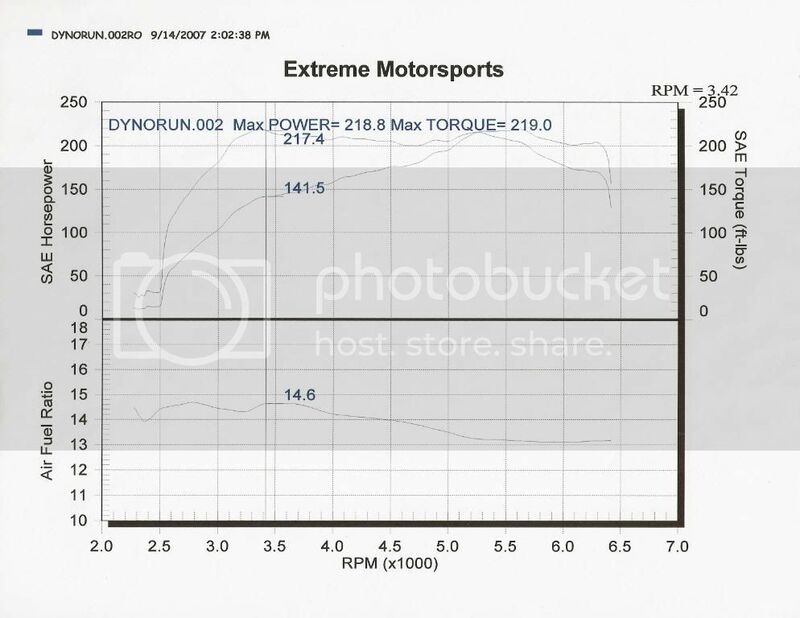 The biggest issue with comparisons like these is the variance in dyno's, I have seen my car dyno 10 rwhp less on the same dyno with no changes to the car just because of weather. Eddy current dyno's are very accurate, and give lower results than inertia (roller drum) dyno's but they are not nearly as consistant. 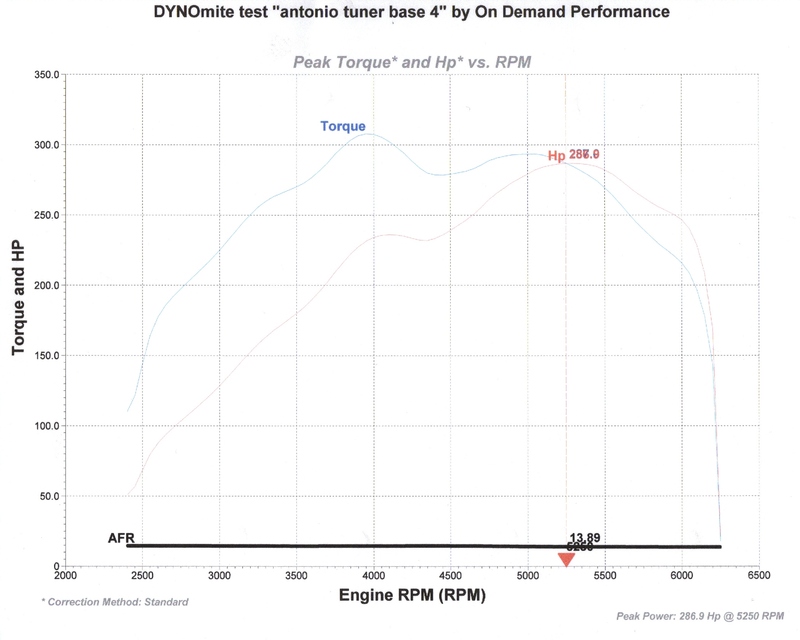 You can repeat results on a Dynojet pretty well, not nearly as easy on Dyno Dynamics. I also learned that the GXP heat soaks very quickly, and usually the second pull will give the best numbers. I am sure it has to do with heat, turbo does better warm but not hot. 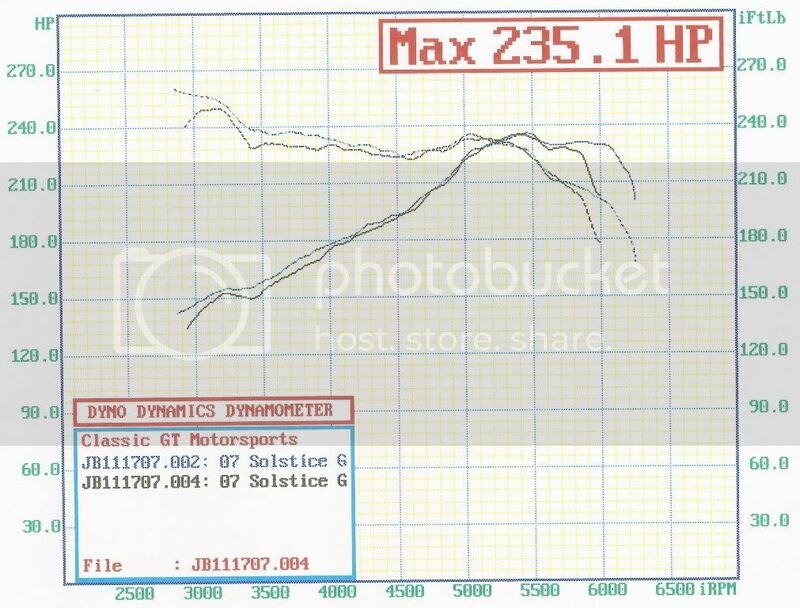 Magnaflow Cat Back -219 RWHP (Dyno Dynamics, 3rd gear pull) I dunno why they didn't do a 4th? Last edited by Deepbluegxp; 09-09-2008 at 12:15 PM. here's my before and after dynos (dyno-mite). I haven't dynoed my car w/ the water meth kit yet. I'll do it this coming Friday. Last edited by sky888; 09-09-2008 at 02:03 PM. Amazing nose dive power takes after 5500 rpm on all these graphs. We need a bigger turbo. Bigger turbo and a standalone engine management! Actually if you look at mine, the dyno operator stopped recording at 5700 and the HP was still up there. I need to go back and get him to push it to the redline (7400) I'd like to know where my power fall off. Hopefully the larger wheel with the power management settings out of the way, it will show a good increase past 5500 RPM.